Silver Sponsor of the MDA Black-N-Blue Ball | Hupy and Abraham, S.C. Marking the 25th anniversary of this incredible charity event, the Muscular Dystrophy Association (MDA) “Black-N-Blue-N-Silver” ball kicked off May this year. And as it has for over ten years, the law firm of Hupy and Abraham, S.C. was once again proud to be a sponsor and longtime supporter of one of Wisconsin’s largest, most successful and longest running fundraisers. Bringing everyone from bikers to corporate leaders together for this special night, the MDA Black-N-Blue-N-Silver ball raises funds every year to find a cure for neuromuscular diseases like muscular dystrophy and amyotrophic lateral sclerosis (ALS), and provide comprehensive health care services to MDA families nationwide. Support is generated through live and silent auctions, which run through dinner, a motorcycle raffle, a wine pull, guest donations and so much more. In theme with presenting sponsor Harley-Davidson Motor Company, attendees are encouraged to wear attire that follows a casual theme such as biker leathers and bluejeans. The night focuses almost entirely on the stories of the benefactors of the ball, as users of MDA’s programs and services give testimonies detailing the impact funding for both research and aid has had on their lives. Special guests of Hupy and Abraham this year included Ron Brefka of the High Voltage Motorcycle Show and High Voltage Ice Races at Wilson Park, Joe Stern of the AOA, Ron and Melinda Gasser of ABATE of Wisconsin and Kevin Frank of the Brewton Rumble and BUILD Moto Mentor Program. During the event, guests had an opportunity to peruse the auction items, enjoy a cocktail reception by Surg Restaurant Group, talk to MDA support recipients, try the new Harley-Davidson electric “Revelation” and even take a photo with Willie G. Davidson. 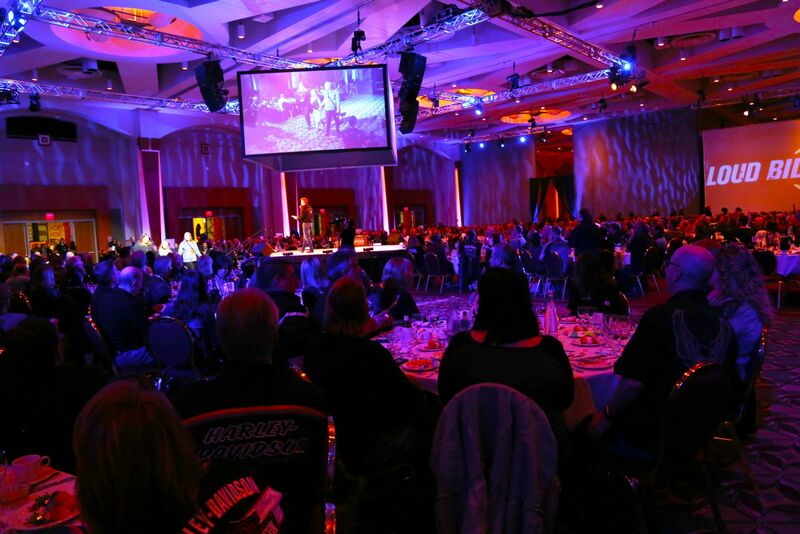 After the cocktail hour, guests were ushered into the main event and treated to a five-star dinner and appearance from guest emcee Ted Perry from FOX 6. Every year, the Black-N-Blue-N-Silver Ball continues to grow in popularity and recognition. This year, attendance clocked in at just over 1,000 with a fundraising goal of $1.5 million. And as the Black-N-Blue-N-Silver Ball continues to become more popular, companies like Hupy and Abraham will keep committing their support to show that they as a company, and as bikers, stand with the strong men, women and children of the MDA.